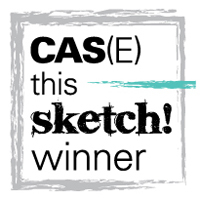 Here's a quick an cheery card for Splitcoast sketch challenge #281. 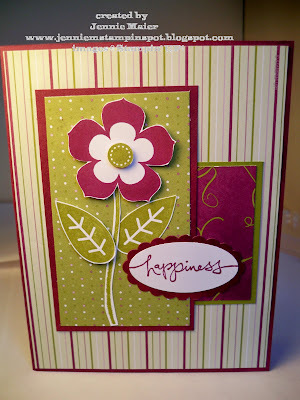 I used the Petal Pizzazz stamp set with the Cottage Wall DSP. I started by stamping the flower image twice, once in Rich Razzleberry and then again in Old Olive. 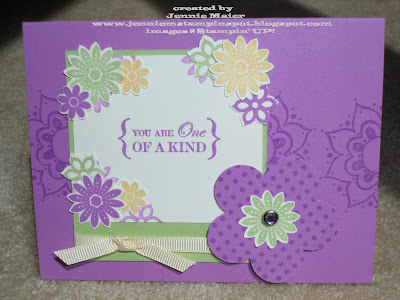 I cut out the flower and then the center circle and popped up the Olive circle with a Stampin dimensional. I then stamped the stem and leaves in Old Olive and cut them out too. 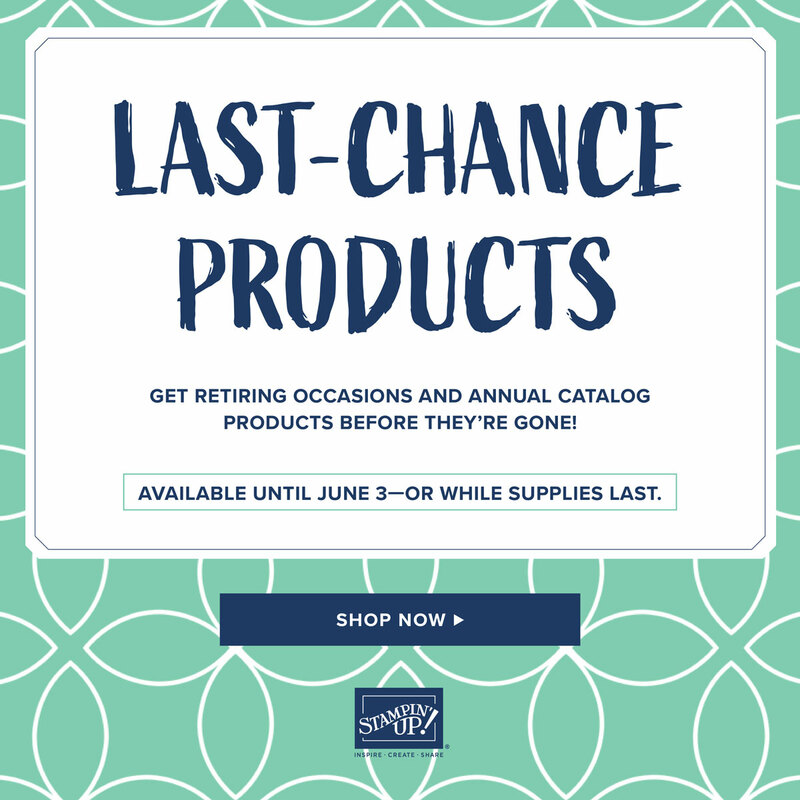 One leave is popped up with Stampin dimensionals. "Happiness" is from Warm Words and that was stamped in Rich Razzleberry, punched out with the Large Oval punch then layered onto a Rich Razzleberry piece punched with the Scallop Oval punch. I haven't used my To the Nines Specialty paper lately and I think they're perfect for a Father's Day card. I paired the papers with the Splitcoast sketch #280 here. I started with a base of Sahara Sand card stock. Then, I just cut the coordinating papers to fit the sketch. I also added some Always Artichoke and Chocolate Chip card stock. The sentiment is from All Holidays and I stamped that in Chocolate Chip on Whisper White then stamped it again in Sahara Sand and cut that out and popped it up with Stampin dimensionals. Back to Stamping with Two Challenges! I've been away from my stamping quarters too long! I did enjoy a quick get-away to Colorado Springs with my hubby though. Boy are those mountains beautiful! 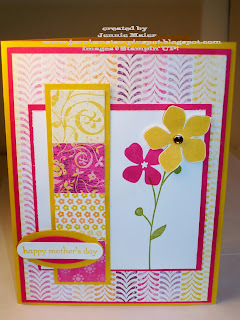 I thought I'd use the PPA Theme Challenge here AND the Stamping 411 sketch here. So I started with a base of Whisper White and added a rectangle of Real Red card stock. 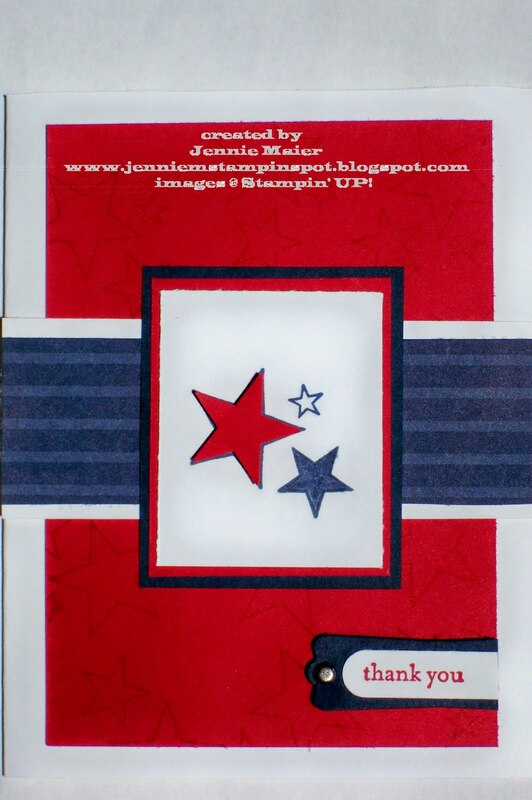 I stamped the triple star image from Starring You in Real Red classic ink on that Real Red card stock. I used a strip of Night of Navy from the Patterns Pack III Hostess set. Then I stamped the stars in Night of Navy ink on Whisper White. I colored one star with blender pens and Night of Navy ink and punched out a Real Red one with the Star punch and popped that up with a Stampin Dimensional. "Thank you" from Teeny Tiny wishes was stamped in Real Red, punched out with the Word Window punch and layered onto a Night of Navy piece punched with the Modern Label punch. Finally, a Silver brad was added for a little flair. This birthday card is for the Stamping 411 sketch #151 here. 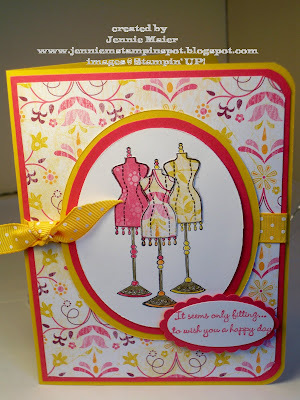 I used the Chic Boutique stamp set and Razzleberry Lemonade DSP. 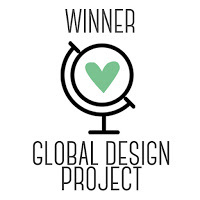 I started by rounding the corners of the card stock and DSP and stamping one of the dress form images in the center of the oval circle (which I used my Coluzzle to cut out). Then I masked that and stamped another image on each side. I paper pieced the dress forms with the different Razzleberry Lemonade papers and colored in the rest of the forms with Crushed Curry, Melon Mambo, Pumpkin Pie and Soft Suede Stampin write markers. 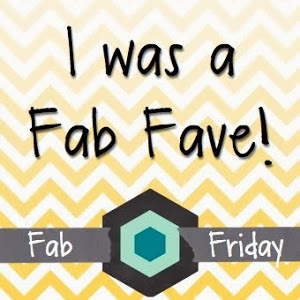 I stamped the sentiment in Melon Mambo, punched that out with the Large Oval punch and layered that onto a Melon Mambo piece punched with the Scallop Oval punch. A piece of 1/2 inch Crushed Curry polka-dot grosgrain finishes it off. 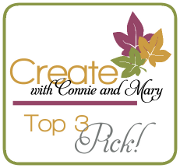 Here's my take on the PPA#42 Color Challenge to use Old Olive, Real Red and Tempting Turquoise at PPA here. 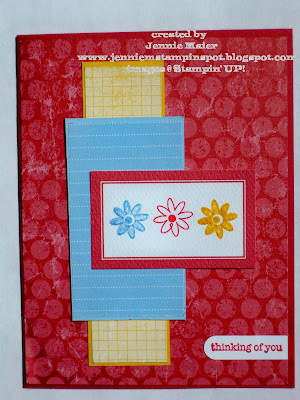 I used a sketch from the January Stampin' Success ( a magazine we Stampin' UP! demos get each month). 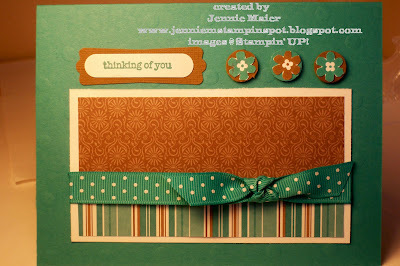 I started with a Tempting Turquoise card stock base and added a strip of Turquoise DSP from the Pink Flamingo DSP. 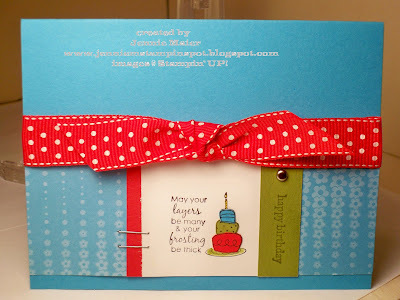 I stamped the image from Birthday Bliss in Basic Black on Whisper White card stock. I then paper-pieced the cake in the three colors. "Happy birthday" from Teeny Tiny Wishes was stamped in Old Olive on Old Olive card stock and a Silver brad was added to that piece. A few staples and the 3/4 inch Real Red polka-dot grosgrain ribbon finishes it off. This one is for the Stamping 411 sketch #150 here. I started with a base of Bermuda Bay and ran that thru the Big Shot with the large polka-dot texturz plate from the Stampin UP backgrounds 1. The rectangle of papers is from Thoroughly Modern DSP with a piece of 1/2 inch Bermuda Bay polka-dot grosgrain ribbon. 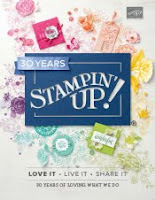 Stamps from Little Flowers were stamped in Bermuda Bay and Soft Suede then cut out an adhered to a 1/2 inch circle punch of the same colors and popped up with Stampin dimensionals. 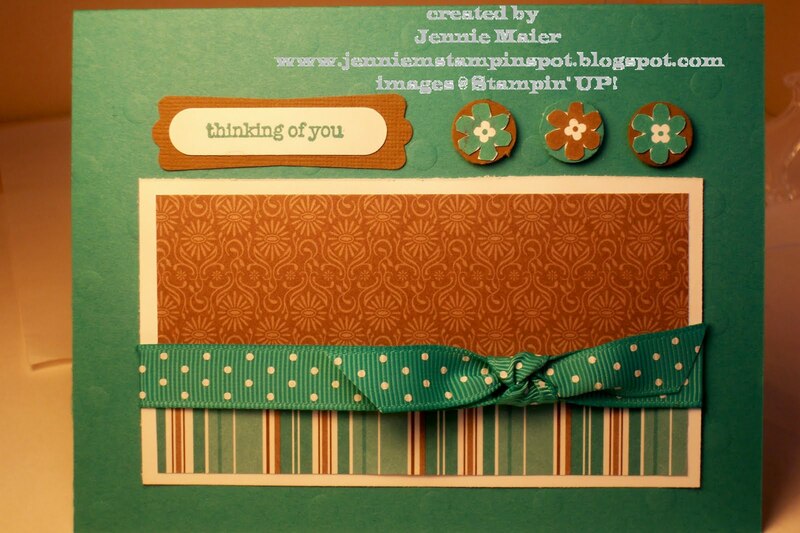 "Thinking of you" from Teeny Tiny Wishes was stamped in Bermuda on Whisper White then punched with the Word Window punch and layered on to a Soft Suede piece punched from the Modern Label punch. Here's the card I made for my mom for Mother's Day. She loves purple so I thought of Orchid Opulence. 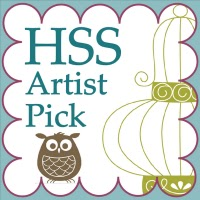 My card is based on this card by Andrea Walford. I kept the basic design but totally changed up the colors. I used a base of Orchid Opulence and stamped the main flower image from One of a Kind in the same ink. 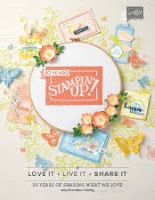 The little flowers come from the stamp that coordinates with the Boho Blossoms punch. I used Certainly Celery and So Saffron and Orchid Opulence then just punched out the flowers. The sentiment is in Orchid too. 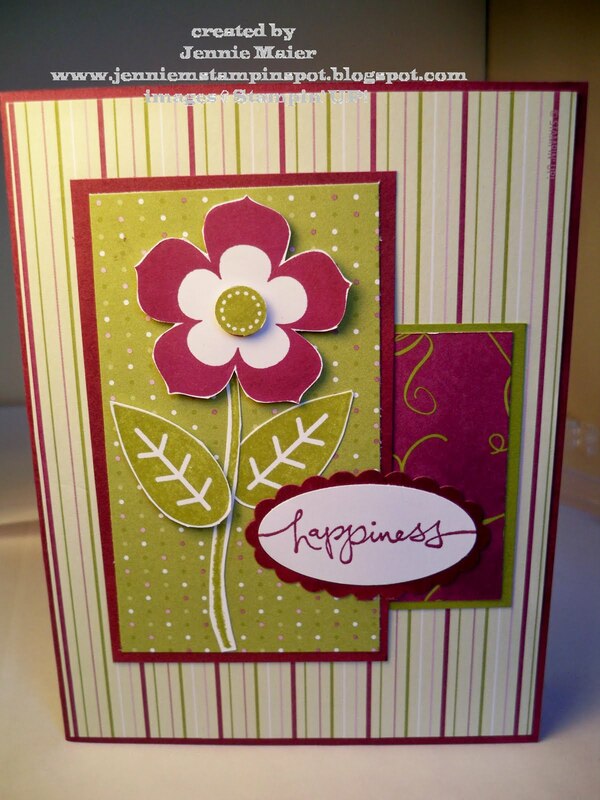 I used Dot, Dot, Dot in Orchid then punched it out with the Extra Large Fancy Flower punch. A Circle Ice brad is in the center of the Celery flower. Finally, a piece of 1/4 inch Very Vanilla grosgrain finishes it all off. 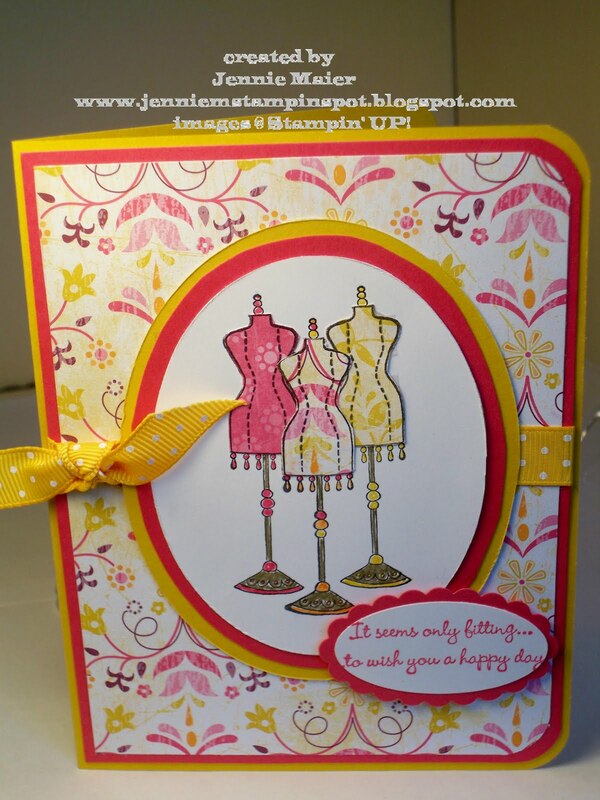 I saw this adorable card by Julie Davison and made mine with some Rich Razzleberry and Razzleberry Lemonade papers. 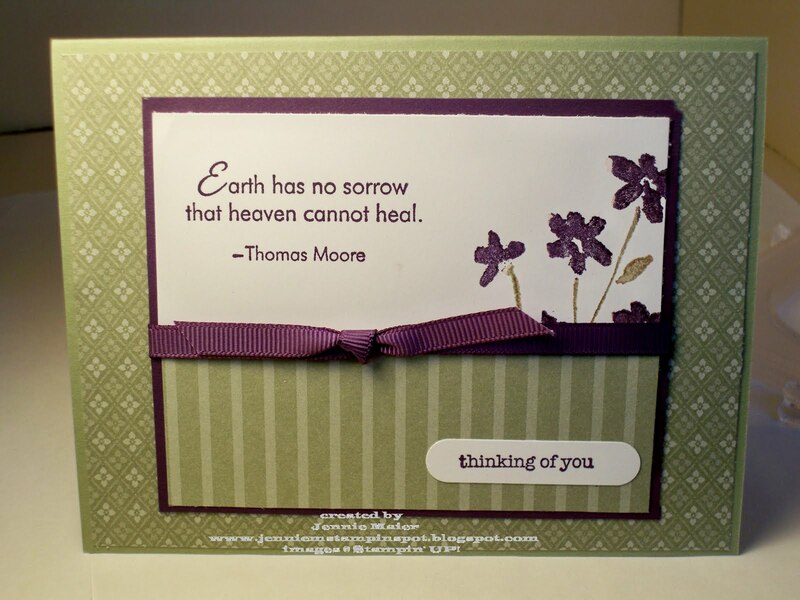 I can always use some blank/all-occasion cards and this one works perfectly. It came together so quick! I started with a base of Rich Razzleberry card stock. Then I added some of the Crushed Curry Razzleberry Lemonade DSP and a strip or Rich Razzleberry from the same DSP. I punched out a Razzleberry flower with the Extra Large Fancy Flower punch. 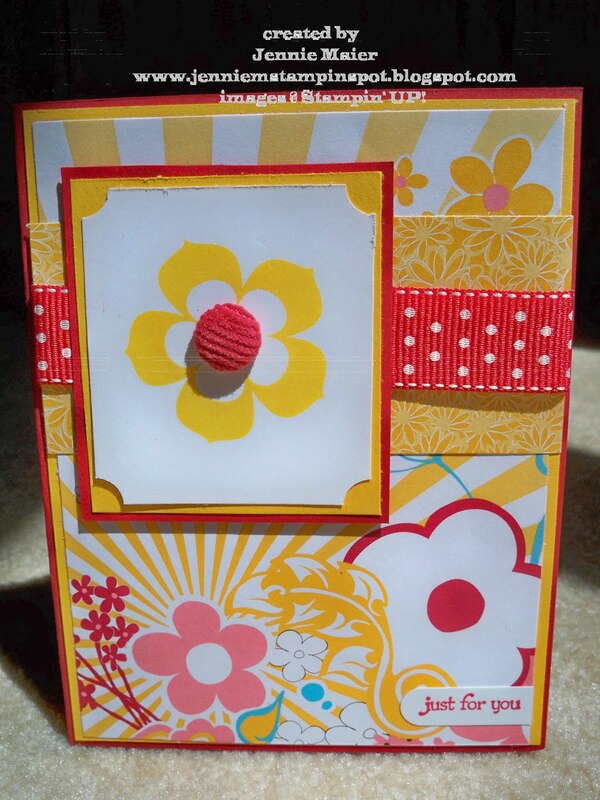 I stamped the flower from Petal Pizzaz in Crushed Curry and punched that out with the 1 1/4 inch circle punch. 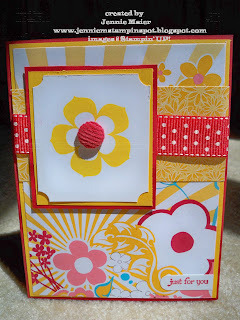 I added a Circle Ice brad to the center and popped it all up with some Stampin dimensionals. Finally, a piece of 5/8 inch Whisper White ribbon finishes it off. This quick card covers two challenges. 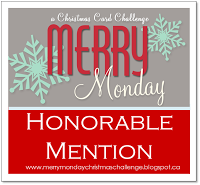 First, the PPA#41 Inspiration Challenge here AND the Splitcoast sketch challenge #279 here. The colors I thought of from the pictures were Bashful Blue, Crushed Curry and Ruby Red. So naturally, I grabbed The Write Stuff Specialty DSP. The base is Ruby Red with a piece of the DSP, then a piece of the Crushed Curry DSP and a piece of very retired Bashful Blue DSP. 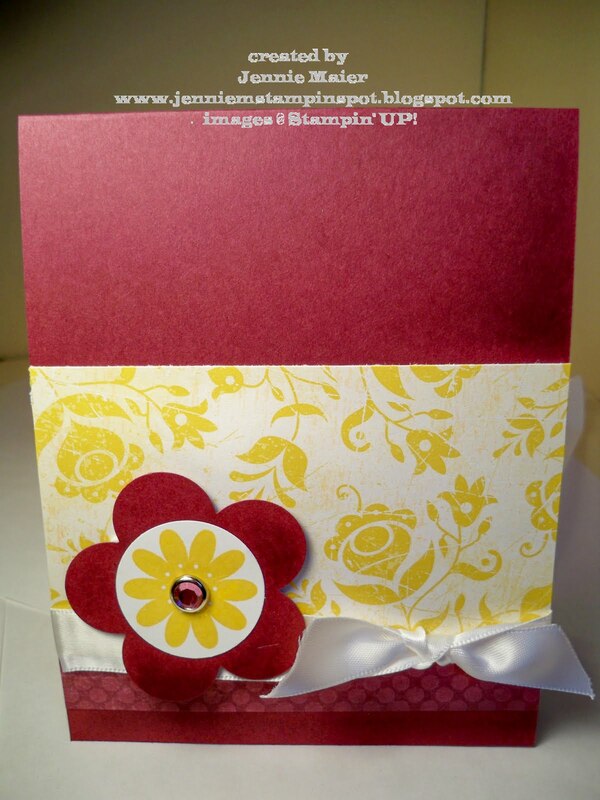 The die cut is also from The Write Stuff DSP and I stamped the flower images from Holiday Blitz in Bashful Blue, Ruby Red and Crushed Curry. Finally, I added "thinking of you" from Teeny Tiny Wishes which was punched out with the Word Window punch. 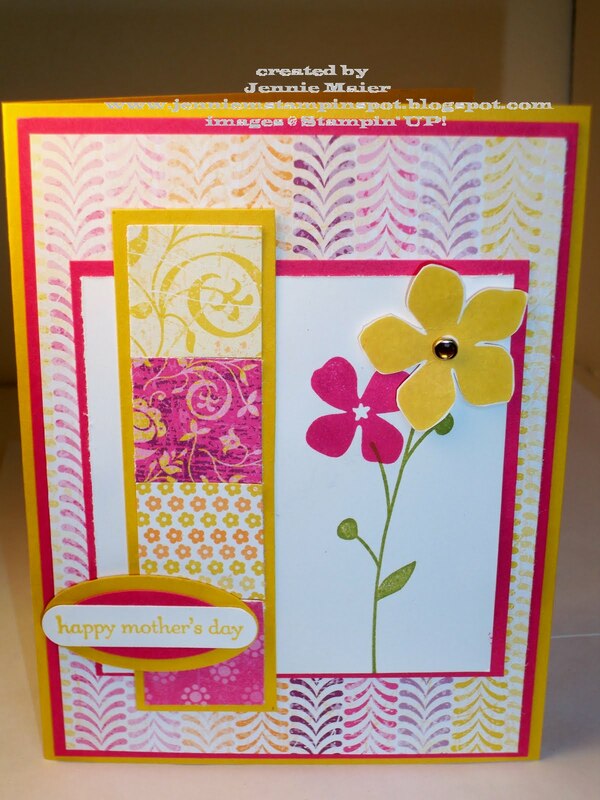 This cheery card was made for a special lady for Mother's Day and for the Stamping 411 sketch #149 here. It starts with a base of Real Red, then some Summer Sun card stock then a piece from the Pink Flamingo DSP. I stamped a flower from Petal Pizzazz in Summer Sun and punched the corners of the Whisper White piece with the Ticket Corner punch. That piece was layered onto Summer Sun then Real Red card stock. A Real Red corduroy button is in the center. A coordinating strip of Pink Flamingo is under that panel with a piece of 3/4 inch Real Red polka-dot grosgrain ribbon. Finally, "just for you" was stamped in Real Red ink and punched out with the Word Window punch. Here's another Mother's Day card I made but I won't say who is getting it quite yet. I used the Mojo Monday sketch#137 here. I started with a base of Crushed Curry and layered on a piece of Melon Mambo. Next, I used some Razzleberry Lemonade DSP for the big piece and for the little squares. The sentiment is from Teeny Tiny Wishes and that was stamped in Crushed Curry, punched with the Word Window punch and layered onto a Melon Mambo piece punched with the Small Oval punch and a Crushed Curry piece punched with the Large Oval punch. The flowers and stem are from For All You Do and were stamped in Old Olive, Crushed Curry and Melon Mambo. The Curry one has a Circle Fire Rhinestone brad in the center and was popped up with Stampin dimensionals. Unfortunately I've been asked to make some sympathy cards so I thought of the Patterns Pack III in Mellow Moss combined with Elegant Eggplant. I figured I might as well use up my Mellow Moss papers since it will be retiring in June. I started with a piece of Mellow Moss card stock as the base and layered a piece of the Moss Patterns on top of that. I stamped the sentiment in Elegant Eggplant and the flowers were colored with Elegant Eggplant and Mellow Moss. "Thinking of you" from Teeny Tiny Wishes was stamped in Elegant Eggplant then punched with the Word Window punch. A piece of 1/4 inch Elegant Eggplant grosgrain ribbon finishes it off.